Abstract: In Can Tho City area, like much of the Mekong Delta of Southern Vietnam, both the Kinh and Khmer ethnicity farmers and agricultural wage laborers have had to cope with many changes due to emerging national agricultural policies, the move to a market economy, increased labor market competition and new land market policies. Many landholding farmers lack sufficient labor for intensive rice production and so must rely on seasonal agricultural wage laborers for their harvests. Seasonal agricultural wage employment provides important livelihood opportunity for landless and land-poor Khmer ethnicity workers from other parts of the Mekong Delta, but this work is precarious. The long-term survival of this intensive labor system is uncertain in the context of current moves towards agricultural mechanization. Keywords: Livelihood, market economy, mechanization. Can Tho City plays an important part in the political, cultural and economic development of the Mekong Delta region of Vietnam, which has in recent years experienced continuous urbanization; this urbanization process has increased since 2004, when the area was separated from the old Can Tho Province to create the new Can Tho City area, which is governed by the Vietnamese Central Government. Qualitative and quantitative analyses were applied in my study. The analysis for the larger study from which this paper is drawn involved the relations between Kinh and Khmer land-owning households in Thoi Thuan B and poor Khmer laborers from Soc Trang in their strategies of household livelihood. I picked the study area of Thoi Thuan B because it has had a large number of Khmer ethnicity people living together with Kinh ethnicity people for a long time and because farmers in the area experience shortages of local labor in the intensive rice production which is their main income-earning crop This intensive production system depends on professional hired laborers from nearby Soc Trang province who migrate to Thoi Thuan B seasonally for the rice harvests. Kinh and Khmer land-owning households were interviewed in Thoi Thuan B hamlet, while a number of Khmer ethnicity laborers from Soc Trang were interviewed in both Thoi Thuan B and Soc Trang. My study is focused on the livelihoods of the different Kinh and Khmer ethnicity land-owning households which have had to intensify rice farming to improve their incomes, and particularly those who have hired Khmer laborers from Soc Trang province. The data for this paper is part of data from a larger research project. The data for the findings reported here were gathered from participants (farmers, landless people, local officials), through five focus group meetings and discussions with a total of 50 farmers (including the different economic household groups of Kinh and Khmer people, the village elders and hamlet officials), and in-depth interviews with 39 households and individuals (both farm and landless households andboth Kinh and Khmer households are represented). Data was cross-checked through field observations and secondary information obtained from various local studies and reports. My fieldwork spanned three years, from April 2007 to March 2010, with an actual total of one and a half years working in the study site. Overall, my study sample comprised about 20% of the total households in the hamlet. Data on the different kinds of households was collected and analyzed using quantitative methods (using Excel) for description and comparison of the different labor use in the intensive production system to each period of time. I also used qualitative methods to capture the livelihood diversification experiences of the Khmer laborers from Soc Trang in order to reveal the livelihood strategies they use to adapt to the market competition of agricultural production and pressure of the labor market. With respect to the contribution of hired labor to the rice harvest in Thoi Thuan hamlet during the period of 1993 to 2009, both the Kinh and Khmer farm households in the hamlet were using more hired labor to harvest rice by the end of the period. Hired labor in the hamlet comprised two-thirds of the total labor force in 1993 but three-quarters of the total labor force in 2009; this increase reflects the hamlet’s increase in rice growing frequency from two to three rice crops per year, which resulted from the need for food security and the rice export demands in the country over recent years. However, both a shortage and a surplus of local occurs in the Kinh and Khmer communities, with a shortage of local labor taking place during harvesting time but a surplus occurring during slack rice growing periods, leading to underemployment in both on-farm and off-farm activities in the hamlet during non-harvest seasons. In general, the younger generations of both the Kinh and Khmer households prefer to work at factories in the industrial and urban areas of Can Tho and Ho Chi Minh City, rather than participate in farming activities in rural areas (Famers’ Group discussion, 2007). These younger people are pulled into labor markets in the urban and industrial areas in the region. As a result, the middle-aged and older men and women are left to manage the farm activities, while the children share the farm work with their parents when they are free. Normally, the elderly and the children manage the housework and livestock. Industrial activities are expanding in Can Tho City but are still limited in Thoi Lai. Many small and medium sized rice millers, as well as rice export actors at the local, regional and national levels, such as the Food Processing Company of Mekong and the Co Do State Farm, are recruiting an increasing portion of the local labor force, but such organizations typically provide only seasonal and unstable jobs. Jobs available from such employers compound the situation of labor shortage during and just after rice harvests and underemployment during other times. During the research period, other types of local seasonal off-farm activities were also unstable due to local conditions, which may be indirectly influenced by the yields of rice crops in the hamlet, the demand for and supply of paddy and export rice, and the rice export policies of the state. While these important factors have had a positive impact, as is apparent with the increasing level of income for farmers from the first rice crop of the 2007/2008 season, due to the high price of paddy at that time, at other times, however, they also have had negative impacts, such as the decreasing income of the farmers and hired laborers due to fluctuating paddy price, unemployment in the rice processing factories in Thoi Thuan B hamlet and the poor third rice crop in the Mekong Delta in 2008. Indeed, the state’s rice export policies have had an impact on both employment and the level of income for the hired laborers, farmers and other social actors. It appears that the rice farmers/companies from Thoi Thuan B are increasingly impacted by global markets and demand for rice, which impact prices for rice. The driving forces of urbanization, industrialization, commercialization, regionalization and globalization have shaped the networks and sources of local and hired agricultural labor in the study area, particularly for rice production. As a result, the farmers in Thoi Lai, Can Tho and many other provinces in the Mekong Delta have had to use hired labor from outside the local area, utilizing a labor market network developed between the farmers and the poor landless hired laborers or farmers who have small landholdings. Soc Trang, a province in the Mekong Delta, has the highest number of landless and land-limited Khmers and supplies more professional hired laborers than any other province for the rice harvest seasons that take place throughout the year (Famers’ Group discussion, 2007). Hiring manpower to carry out specific labor tasks has become popular in northern Thai villages (Anan, 1989). 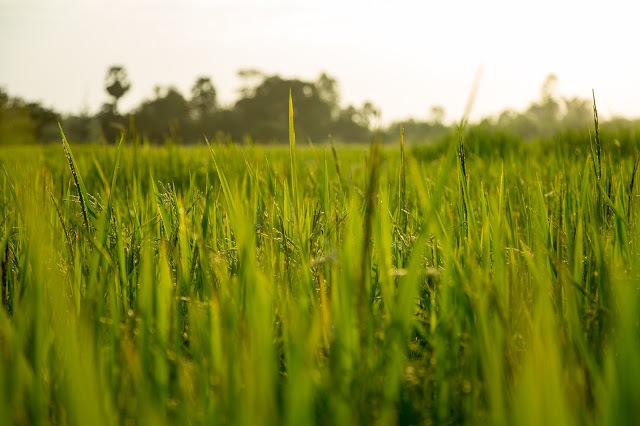 As in the Thai case, since 2005, based on the area’s shortage of seasonal agricultural and problems with previous labor arrangements, Thoi Thuan B hamlet landowners have contracted with Soc Trang workers to harvest their three annual rice crops. Normally, the landowners make a contract with the local labor group recruiters about one month after they have sown of the rice crop. These local labor group recruiters are Khmer ethnicity and have kinship ties with Khmer workers in Soc Trang province. For a small fee, the local labor group recruiters contact the local owners of the threshing machines as well as the Soc Trang Khmer migrant laborers. According to my research, in 1993, the Khmer ethnicity rice producing households of Thoi Thuan B Hamlet used 115 hired laborers per hectare of rice production, in comparison with 100 hired laborers per hectare used by Kinh ethnicity rice producing households. In 2008-2009, the Khmer farm households used 204 hired labors per hectare, while Kinh farm households used 182 hired laborers per hectare. This increase of hired laborers in both Kinh and Khmer ethnicity is the result of the loss of local labor to urban areas and the intensification of rice crops. The Soc Trang Khmer landless laborers have become very professional at harvesting rice because they are always on the move from one place to another across many provinces in the Mekong Delta, such as Can Tho, An Giang and others, helping with the three annual rice crops grown in these locations. Soc Trang is a typical province for agriculture and aquaculture and is about 60 km from Can Tho city. Almost all of the labor-sending households in Soc Trang had agricultural land in the past, but now those households tend to have extremely limited or no land due to the combination of population increase and previous sale of their land use rights. The Soc Trang workers have, however, invested in both mobile and landline phones to carry out their business. It is interesting that among the 45 Khmer Soc Trang laborers included in the study, two-thirds have a telephone and/or mobile phone. As a result, the working group recruiters can contact the Soc Trang laborers almost anytime, anywhere, though they may be working in rice fields at the time. Nowadays, these are the modern methods used by the hired laborers, both Kinh and Khmer. For the farmers and laborers in the Mekong Delta, mobile phones serve as an effective means of conveying work information, rather than as a luxury. From their interview responses, the poor landless and land-poor Khmer laborers from Soc Trang Province appear to be actively seeking alternative ways to cope with the risks they face in terms of survival, including diversifying their livelihood strategies through taking on harvesting contracts throughout the Mekong Delta. This seems to me to be similar to the livelihood approach highlighted by Haan and Zoomers (2005), one used by people in order to adapt to changing economic conditions. Two case studies from my in-depth interviews illustrate this point. The poor landless and land-poor Khmers in Soc Trang Province work very hard in difficult conditions in the field. The seasonal nature of their rice harvesting means that if they suffer from an illness or have too much time between harvesting jobs, they may not earn enough to survive. Their constant migration and poor living and working conditions can easily lead to illness and disease. Mr. Sen first harvested rice for the farmers in Thoi Thuan hamlet 18 years ago, with a group of 30 to 40 Soc Trang laborers. Mr. Sen, who bought a mobile phone six years ago to assist with his business, acts as a group leader for the hired laborers. He uses his mobile phone to communicate with the landowners, laborers, car owners, group leaders and middlemen. According to Mr. Sen, the total time the hired laborers spend harvesting rice each year ranges from one to seven months. Myounger brother of Mr. Sen and also a group leader for hired laborers in Soc Trang. Mr. Sin’s wife is illiterate and of Khmer and Chinese descent. Mr. Sin’s daughter finished only primary school; she lives with her husband who left secondary school. Mr. Sin’s older son left primary school and now lives with his wife, who is also illiterate. His youngest child is still in secondary school. Mr. Sin’s son and daughter both got married in their teens. Mr. Sin’s father originally had one hectare of farmland and seven children, but he gave 0.7 hectares to his sons and daughters in 1986. He sold 0.3 hectares for 1.5 ounce of gold to help pay for treatment when he was ill. He passed away in 1993. In 1991, Mr. Sin sold 0.1 hectares of land for half an ounce of gold and asked his relative for a loan to pay a debt due to a failure in his duck farming activities, after which he had to work as a rice harvester to repay his loan. All his brothers and sisters sold their land between 1994 and 2006 and are now landless. Mr. Sin harvests rice in Bac Lieu, Soc Trang, Vinh Long, Can Tho and An Giang Provinces. In 2006, he had more family members available for harvesting rice, obtaining an income of ten million dong per rice crop; therefore, his total family income was 30 million dong for harvesting three rice crops per year, and, after subtracting costs, he was able to save ten million dong for his family. By 2007, his family was harvesting three rice crops for a total income of 35 million dong, and after his costs, he was able to save 20 million dong. However, in 2008 his daughter got married; because of a loss of her labor, that year his family only gained a profit of six million dong. After living expenses, this was not enough money to repay his family debt. At the beginning of 2009 his son married, and now he lives only with his wife and youngest son. When I visited him on March 11th 2009, I heard that he and his two other family members had harvested only 0.13 hectares of rice as agricultural wage laborers, with an income only 140,000 dong (In-depth Interview, March 2009). This case reflects the precarious livelihood of many Khmer ethnicity agricultural wage laborers. In this case, Mr. Sin’s limited land holdings are a result of land fragmentation as generations of parents divide limited land holdings among large numbers of offspring. Moreover, the neoliberal policies which have commoditized land in Vietnam since the country’s 1993 Land Law have meant that poor families like Mr. Sin’s can sell the long-term use rights of their land to raise money in case of illness or other disasters. While such sales may be helpful in the short term, in the long term the families are left without access to sufficient land for survival. While seasonal agricultural wage employment provides an important source of income for such families, unless the family has sufficient adult laborers pooling income, the income may not be sufficient for their survival. As with the family in Case 1, the families in the second case also have had to cope with many difficulties due to changes in national economic policies and the move towards a globalized, neo-liberalist economic strategy. Their loss of farming land has propelled them to new forms of subsistence—seasonal agricultural wage labor in Thoi Thuan B and other areas of the Mekong Delta. But, their subsistence appears even more precarious than the extended family described in Case 1 and may not be sustainable in the long run, particularly as more and more farmers in areas such as Thoi Thuan B hamlet begin to adopt new agricultural technologies such as combine harvesters. This study indicates that the Khmer ethnicity laborers from Soc Trang Province contribute a considerable amount to the rice harvests in Thoi Lai, Can Tho Province. In fact, Khmer farm households in the hamlet use 1.4 times more local hired laborers than the Kinh households for their rice production activities. Soc Trang landless laborers supplied 85 man-days of hired labor for the Kinh in 2008-2009, which is 1.3 times higher than for the Khmer households in Thoi Thuan B hamlet for the same time period. The landless labor force in Soc Trang province supplied at least 20 percent of the labor for rice production in Thoi Thuan B Hamlet during 2008-2009 and an astounding 70 percent of the total hired labor for harvesting rice during 2008 to 2009. This is largely due to the migration of local laborers to other places in search of work, which decreased local labor available for the rice harvests. While they provide valuable seasonable wage labor for farmers throughout the Mekong Delta, the Khmer ethnicity wage laborers from Soc Trang face many difficulties. While providing agricultural wage labor may be a short-term livelihood strategy, as more and more farmers in places like Thoi Thuan B begin to move towards mechanized rice harvesting through the use of combine harvesters, the demand of seasonal wage labor will likely decrease. This would mean that the precarious lives of Soc Trang agricultural wage workers may become unsustainable, possibly driving such workers to urban areas in search of adequate livelihoods. One strategy to improve the lives of both farm families and seasonal agricultural workers would be the development of secondary livelihood activities which can be done in non-harvest seasons. The government should invest in developing such activities as well as finding markets for goods produced. That will help keep more people in rural areas and/or reduce rural seasonal underemployment and help keep workers in rural areas. In the long run, while mechanization of agricultural harvesting may be appealing both to the state, as a reflection of modernization and “development,” and to farmers such as those in Thoi Thuan B facing seasonal labor shortages, the likely impacts of such mechanization on poor agricultural wage laborers such as those from Soc Trang must be considered fully prior to implementation. If further mechanization of agriculture is pursued, then the government should invest in improving the lives and opportunities of landless agricultural workers who will be put out of work by such mechanization. Such workers could be trained for new positions, possibly in the urban labor force. In addition, educational opportunities could be extended to the children of such families so that in the future, the younger generation can take advantage of better economic opportunities, enabling them to support older generations. 1. Anan, Ganjanapan (1989). Conflicts over the Deployment and Control of Labor in a Northern Thai Village, in Gillian Hart et al (eds.) Agrarian Transformations: Local Processes and the State in Southeast Asia (pp.98-122). London: University of California Press. 2. Dung, L.C, Thanh D.N. and Sanh N.V. (2008). Impact of Urbanization on Livelihood and Policy Implication: Case Study in Long Tuyen Ward, Can Tho City, Sustainable Rural Development: Land Policies Rural Development. 3. De Haan, Leo J. and Annelies Zoomers (2005). Exploring the Frontier of Livelihoods Research, Development and Change 36:27-47.